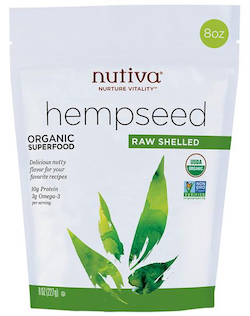 Nutiva Shelled Organic Hemp Hemp Seed 8 oz. Rich in protein, with omega-3 and minerals, hemp is the world's most nutritious seed. The hemp seed is the richest known source of polyunsaturated fats, containing a perfect 3:1 ratio of omega-6 linoleic acid and omega-3 linoleic acid. In fact, the hemp seed balance of Omega 3 to 6 fats is the perfect proportion for human dietary needs, making hemp an ideal addition to a healthy diet and lifestyle. Nutiva simply removes the seeds' hard shells, yielding a 100% raw culinary product that tastes like pine nuts. Enjoy straight out of the bag or sprinkle on your favorite foods.